Kailyn sent Jenelle a peace offering during the March 25 episode of ‘Teen Mom 2’, but it went up in flames when Jenelle torched it and called Kailyn an ‘idiot’ for trying to end their feud. 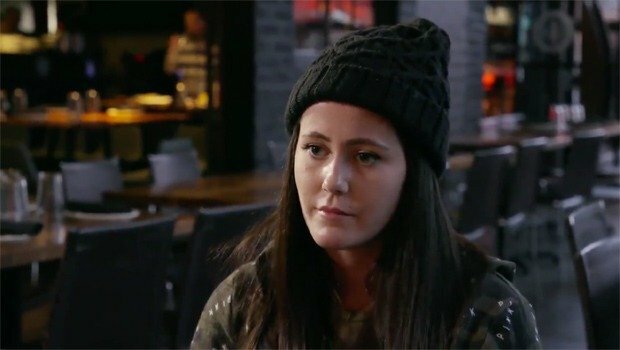 Jenelle Evans wasn’t too happy when she received a present from co-star Kailyn Lowry during the March 25 episode of Teen Mom 2. So upon receiving the gift — a package of Kailyn’s Pothead Haircare products — Jenelle poured gasoline onto it and lit it on fire. “Hey, Kail. This is to your peace offering,” Jenelle said in a video posted on her Instagram page just before the gift went up in flames. The post initially went on Jenelle’s page on Dec. 21, 2018, so this is the first time we’re seeing the incident air on TV, but it’s also the first time we’re seeing how Kailyn reacted to the video. And let’s just say that Kailyn wasn’t too upset about it. In fact, she thought the video was hilarious. Yikes! So it sounds like fans shouldn’t get their hopes up about Kailyn attending this season’s forthcoming reunion, which by the way, hasn’t even filmed yet. Meanwhile, Chelsea was forced to confront Adam‘s parents about continuing their visits with Aubree, and considering how quiet she usually is, her producer was shocked to hear she finally laid down the law with them. Basically, Chelsea told Adam’s parents that they might need to put their visits with Aubree on hold since they keep breaking the rules and allowing Adam to come by when they’re with her. His parents never answered Chelsea’s text, but they did visit Aubree during one of her school lunches (they’re allowed to do this), and Chelsea became even more upset after Aubree told Chelsea that Adam’s mom talked to her about their ongoing issue with Chelsea. So late, when talking to her dad, Chelsea revealed that she really wants Cole to adopt Aubree in case anything happens to her. That way, Cole could still raise Aubree and she wouldn’t be left with Adam. But again, Chelsea doesn’t want to go through with the adoption until Aubree shows interest in it. And in other Teen Mom 2 news, Lincoln welcomed a new brother, Leah received an update on Ali’s vision (her one eye’s far sight has gotten worse), and Barbara told Jenelle that Andrew‘s mom never gave her her address when she tried scheduling a visit between her and Jace.